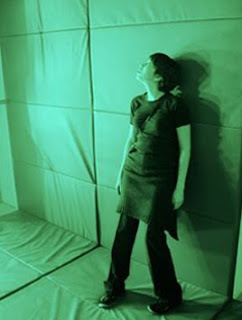 The Melatonin Room is a physiological architecture project, by swiss architects Jean-Gilles Decosterd and Philippe Rahm, that acts on space itself by transforming its electromagnetic composition. This room is defined as a hormonal stimulation space. The melatonin regulates levels of alertness in the human body. A high level induces sleepiness, a low level greater alertness Two climates are produced in alternation. The first is defined by the emission of a bright green electromagnetic radiation at 509 nm, at an intensity of 2000 lux, which eliminates the production of melatonin, the space becomes thus a physically motivating place. The second climate is a dissemination of ultraviolet rays, bathing the visitor in soft blue light which stimulate the production of melatonin. 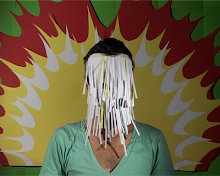 This "physiological architecture" explores the ways environments can change consciousness. 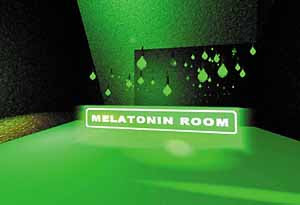 The Melatonin Room is a nonrepresentational space that reduces the medium between the transmitter and the receiver to the greatest possible extent and acts on the chemical mechanisms of things inter se. It works on the new forms of communication, engendered by the biotechnologies and genetics that have come to join analog, poetic, esthetic and rhetorical communication. Melatonin is a hormone produced by the pineal gland, located in the brain. This gland reacts to the light information received by the retina. Melatonin secretion normally occurs at night, since it is activated by the absence of light. Little melatonin is secreted in the daytime. The secretion of melatonin gives the body and the mind information related to sleep and fatigue. It is linked to circadian rhythms and biological clocks. It is a factor in puberty and sperm production in human beings. 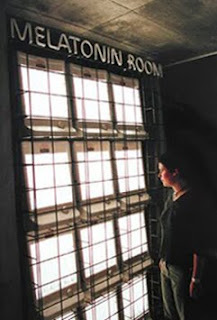 The Melatonin Room constitutes research toward the electromagnetic characterization of space and its physiological impact on human metabolism.